Discover the Heart of the Mississppi River Valley! You'll feel at Peace and Home at Cedar Ridge! Cedar Ridge Resort is located between Alma and Nelson in Buffalo County Wisconsin. 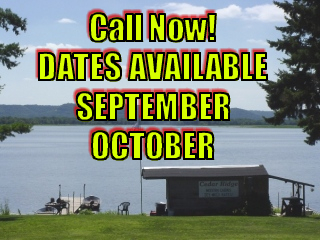 Wabasha, Lake City, Red Wing, Winona, Lake Pepin and LaCrosse! Experience the Hospitality of a B&B along with the Privacy of Your Own Cottage! Here at Cedar Ridge Resort You'll be Treated to Spectacular Bluffs & Sunsets! On Our 300 feet of Private Shoreline!!! Up and Down the Great River Road!!! If No Answer Please Leave a Message.